5,000 psi seal test directed at rotating cement head operating conditions - Kalsi Engineering, Inc.
One of the critical steps in completing an oil or gas well is pumping cement into the well annulus that is located between the casing and the bore of the well. Among other things, cementing provides zonal isolation, and provides support and protection for the casing. Rotation of the casing string during the cementing job helps to expel drilling fluid from the contact area between the casing and the formation, and to provide more even cement distribution—and is more effective than reciprocation. Rotation during the cementing operation typically involves the use of a rotating cement head and pressures less than 5,000 psi. Kalsi Engineering just completed a 4,800 to 5,000 psi (33.09 to 34.47 MPa) rotary seal test of -303 plastic lined seals that was directed at rotating cement head type operating conditions. 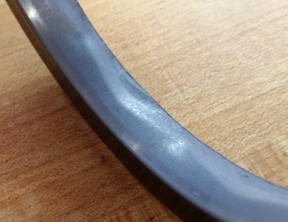 Although we strongly recommend the use of floating metal backup rings to provide the smallest possible extrusion gap clearance for such high pressure sealing conditions, this 50 hour high pressure seal test omitted the backup rings. Instead of backup rings, a housing was used that established a relatively large diametric extrusion gap clearance of 0.020” (0.51mm). The mandrel was rotated at 80 ft/minute (0.41 m/s), and the seal lubricant was an ISO 150 viscosity grade lubricant that was maintained at ~110°F (43.3°) As shown by the representative image included below, the seals were in excellent condition at the conclusion of the test. The use of floating backup rings (described our rotary seal handbook) allows higher pressures and speeds to be achieved. Contact us to discuss how Kalsi Seals can be used to make your cementing operations more reliable, or to request a high pressure seal quote.